Alia is your typical upwardly mobile millennial living in a metro – social and tech savvy. She ‘Snapchats’ a morning selfie to her gang at 7 AM with her personalised bitmoji. On her way to work, she flips through her news app and Cosmopolitan on her phone and orders her favourite coffee straight to her desk. She orders groceries from her mobile app on her way back home… Post dinner, she catches up on her regular Netflix series (she couldn’t resist subscribing to it after her 1-month free trial). She winds up her day, levelling up on a new hip game in town and watching short comedy video clips on YouTube. The advent of this “always on consumer”, provides brands with a wide range of ample new opportunities — namely digital ones. Let’s wake up and smell the digital reward! Here are some of the trends that are inevitable over the next few years. So, What are Digital Rewards? Digital rewards are incentives of digital nature having a monetary value, delivered to the customer via a digital medium. Digital rewards include music & video streaming, data recharges, online magazine subscriptions, e-books, short-form content like small audio/video clips, in-app purchases and so on. 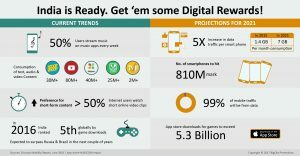 Savvy businesses can leverage these new trends (see Infographic), like growing consumption of different forms of content – music, videos, text… and the growing preference for short form content, by using relevant bite-sized content as digital rewards for customers. Another major advantage of digital rewards is that the redemption is instant, easy and can be done anywhere. Using digital rewards, brands can now achieve multiple objectives like increase in sales, customer engagement, gratification, and customer loyalty easily and instantly. Moreover, results from digital reward programs are a 100% measurable, and it’s easier to optimise for better results since multi-variate testing becomes possible with digital rewards. Data traffic per active smartphone in India is projected to grow five times to 7 GB (1.4 GB in 2016) of data consumption per month by 2021. And the number of smartphones is projected to touch 810 million. From a regional aspect, currently 45% of online users consume regional language content and this percentage is expected to increase with the growth of internet users.Also, the preference of the Indian consumers towards vernacular and regional language content is constantly on the upswing, with 93 percent of time spent on videos in Hindi and other regional languages. This essentially means that whether brands are ready to embrace digital rewards or not, their Indian consumers are. This is irrespective of whether their customers are metro-dwelling millennials or housewives in Tier II cities. Welcome to the age of content-guzzlers! Customers can be segmented and in accordance gratified based on the type of content they are consuming. For instance: the +40M users of DailyHunt (see infographic) can be rewarded with a free 1-month subscription to an online weekly magazine. Or the +25M Saavn users can be gratified with a free song on completing a task on the brand’s social page. The biggest value addition for a brand in case of a digital reward is that a relevant customer base can be instantly gratified with bite-sized content using completely automated targeting. Deliver Instant Gratification. Achieve Wider Reach. Most brands’ customer segments fall under “instant gratification”-crazed millennials. Digital rewards are instant, easy to access (straight to the customer’s mobile) and can be redeemed and enjoyed anytime & anywhere. Given the digital nature of these rewards, all customer segments can be targeted without geographical constraints. And there’s more – say adios to distribution costs if your brand is planning to target a large set of customers in multiple geographic regions. The cost of a technology set-up and its easy scalability for distributing digital rewards are a fraction of physical distribution costs for the same targeted set. Alia’s internet service provider could incentivise her with an extra 10 GB data for free, if she pays her monthly bill before time, rewarding desired customer behaviour. #lovefreedata #tellingallherfriends about how her @InternetServiceProvider gave her free 10GB on paying her bills on time. Alia’s bank could gift her a 3-month subscription to online magazines on signing up for a credit card. The energy bar she picks up on a regular basis, could incentivise her to buying the bigger pack with 8 bars, by giving her free 2-month subscription to a premium fitness monitoring app on the pack itself. Her cab service app could reward Alia’s customer loyalty by giving her free song downloads weekly if she spends a minimum of Rs.1200 per week instead of her average Rs.900. Although the picture painted here pertains to a metro-dwelling millennial, it can have a similar application to a housewife in a Tier II city who could be gratified with an online video clip on how to bake an eggless chocolate cake, or a farmer consuming regional content in his village. Digital reward systems will rapidly encroach on traditional consumer reward tactics because it is tailored to the consumers’ desires and aspirations. It’s a system that does away with commoditised, blanket marketing in favour of the bespoke, in favour of enjoying life’s little pleasures and surprise wins. No matter where the customers are, they can enjoy digital rewards on the go. We have witnessed this growing trend in customers’ preference for digital rewards first hand while running digital reward campaigns for some of the largest brands in India. We are Digital Reward ready! 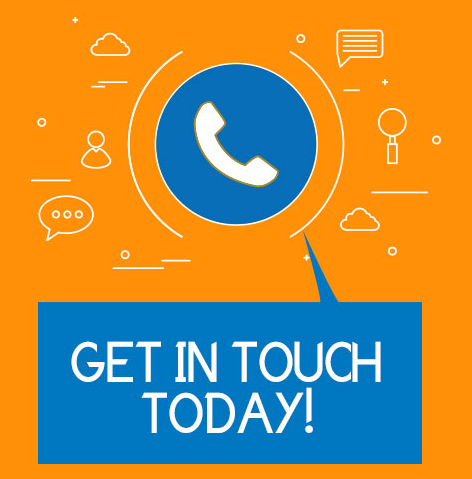 Reach out to us today, and witness how this fantastic new reward solution works first hand!